After I learned the importance of managing your overall wellness at work, I became determined to create a better way for all employees to get healthier and happier. That's me, second from left, stretching it out with some of our clients. Fitness has always been a big part of my life. I first discovered Pilates as a teenager growing up in Australia, and I’ve stayed active ever since. I even got certified as a Pilates instructor during college. After graduation, I got a regular desk job, because that’s what everyone was doing. Despite the 9-to-5 grind, I continued to practice what I preached as a Pilates instructor, fitting in exercise and trying to eat healthy on a budget. What I didn’t realize was that I was neglecting my overall wellness. Sure, I working out, but I wasn’t winding down, practicing meditation, or taking any “me time.” As a result, I worked longer hours, thinking that would solve it since I would be getting more down. But I was working hard, not smart, and neglecting the other aspects of my overall wellness. That’s when I started to think about how I could create a business to help employees—the bread-and-butter of our country’s economy—feel better at work, both physically and mentally. Today, employees no longer want to just go to an office for 8 hours per day. They want to feel invested in their company, and in return, they want to feel like their company has invested in them. When I met my business partner Jon in Los Angeles, we put our heads together. We both had personal training experience and entrepreneurial drive, so we started to work on a B2C business concept. Fitspot was originally conceived as an app that allowed people to book personal trainers, yoga instructors, and other fitness pros on-demand to come to their home, office, or gym. But as we got to know our clients and trainers, we found there was a big piece missing in the corporate wellness space. The common thread: Employers and managers (from Fortune 500 CEOs to startup founders) wanted to offer wellness services to their employees at work. The catch? They didn’t know how to define “wellness.” Just like me, some companies only saw it as an activity—like a workout or yoga class. They also didn’t know how to offer it in a way that worked for everyone—without burdening HR teams with the logistics. We realized that the corporate wellness industry was missing a crucial element: a fully-managed, all-in-one wellness partner. This partner wouldn’t only offer health screenings and flu shots, but also provide a variety of fun and effective services that boost employees’ well-being at work (think manicures, massages, meditation, and more). Plus, companies needed an easy and effective way to get the word out to employees about wellness offerings, and ideally wanted to manage all communication in one convenient place online. After hearing all this awesome feedback, we decided to scale up to a B2B offering that built in all of those wants and needs—essentially the foundation of Fitspot Wellness today. Along the way, we’ve learned a lot about what makes wellness truly work in the workplace. We’ve realized that a robust corporate wellness program has to integrate a number of elements that flow together seamlessly, which inspired us to develop our own version of corporate wellness, called Active Wellness. Our unique approach uses employee feedback and health data to create a fully customizable program featuring fitness classes, stress relief activities, workshops, screenings, and technology. Whenever I see photos of our clients’ employees smiling together after an educational workshop or kickboxing class, I get insanely excited for the positive strides we’ve made in company cultures all over the country. We also have heard a number of amazing success stories from our clients, such as employees who have shed a lot of weight, lowered their blood pressure, or managed their diabetes. Perhaps most importantly, our clients’ employees feel more positively toward their employer and look forward to showing up to work every day. Plus, there’s growing evidence that healthier employees can also boost the bottom line, which makes everyone’s smile a little bigger. Corporate wellness may not be at the top of everyone’s mind, but it should be. At Fitspot, we believe that we’re just at the tip of the iceberg of a corporate wellness revolution, along with companies like Thrive Global. We’re making companies healthier, happier, and more successful, and we’re having fun while we do it. Hailing from Australia, Sammy is the co-founder and COO of Fitspot Wellness (Techstars '16), a certified Pilates instructor, and lifelong lover of fitness. After finding it frustrating to stay healthy in a typical 9-to-5 environment, she and her business partner, Jon, teamed up to create Fitspot, a leading provider of workplace wellness. 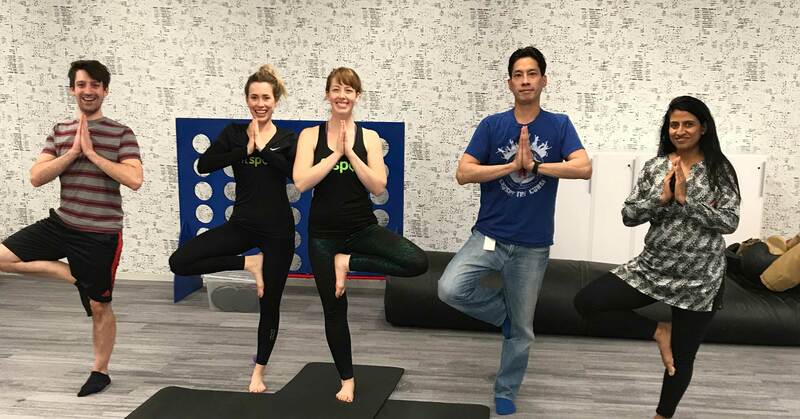 Fitspot is a fully managed wellness partner that provides on-site fitness classes, workshops, massages, meditation, health screenings, and virtual services for employees around the country. Fitspot is on a mission is to help companies reap the benefits of a healthier, happier workforce.